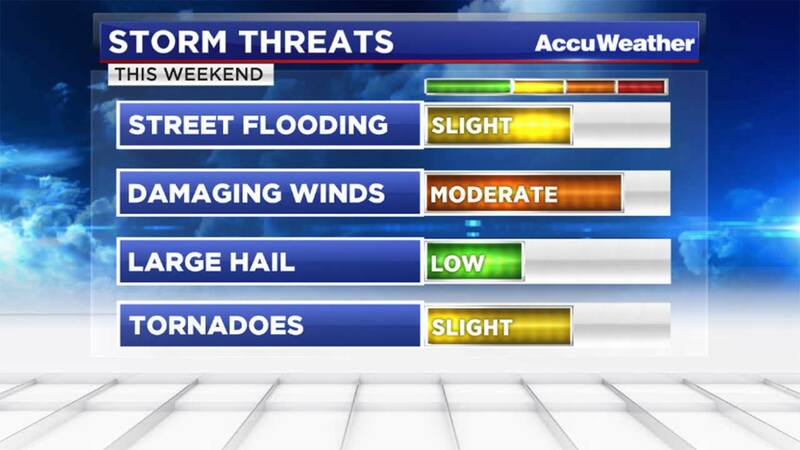 HOUSTON (KTRK) -- A large storm system moving across the middle US will bring gusty winds, rain and potentially severe weather to southeast Texas this weekend. There's the potential for one to three inches of rain across southeast Texas this weekend. Some areas will have more, some less. It all depends on the track of individual storm cells as they move from the southwest toward the northeast. Chief Meteorologist Tim Heller says the rain will begin slowly, with scattered light showers Saturday morning. Stronger storms will begin to develop in the warm, muggy air after noon. Clusters of heavy rain will continue to move overhead Saturday night, followed by a squall line early Sunday morning. The rain should end shortly after noon on Sunday. Tim says some of the storms could produce damaging winds and isolated tornadoes. Street flooding is a concern, but only while the heavy rain is falling. No bayou flooding. Track the storms on radar using the free ABC13 weather app. You'll hear an audible weather alert if any storms become severe.